Cardiovascular disease can manifest in progressive heart failure or sudden cardiac death in humans and other animals. But diagnosing early heart disease is challenging when little is known about normal cardiovascular function in a particular species. That is why Taronga Zoo enlisted the expertise of veterinary cardiologist Niek Beijerink during a recent health check of its resident Sumatran Orang-utans. Aside from attending to routine health care and husbandry needs, annual health exams in zoos are an excellent opportunity to collect baseline data, which becomes important in diagnosing and monitoring treatment of disease. The Zoo is home to two adult Orang-utans, Willow, a 58kg female, and Jantan, a 96.8kg male. The inseparable pair have enjoyed excellent health, thanks to the Zoo’s proactive approach to their well-being. Orang-utans are vulnerable to many of the same diseases that affect humans – gastrointestinal upsets, flu signs and runny noses. In Orang-utan rehabilitation facilities overseas, common health problems include gastrointestinal parasites and gastrointestinal disease outbreaks due to agents including salmonella or shigella. Many such outbreaks are due to contaminated or spoiled food and can be prevented through excellent husbandry and hygiene. Male Orang-utans sport a particularly large laryngeal sac that is inflated to create a loud roaring noise, known as a long call. The long call signals other males to stay away, whilst attracting females for courtship. The down side of having this large laryngeal sac is that it is a common site for infections. “We’ve seen it previously and it can be quite a difficult disease to treat,” Vogelnest said. Like their human counterparts, Orang-utans are prone to getting a little chubby. Willow gained a few kilos but a rapidly-instituted diet reversed those changes. Performing a routine health examination on great apes presents a range of difficulties. The first is their intelligence – just like us, they have a propensity to try to avoid the doctor. As examination requires anaesthesia, the original plan was to hand inject the pair. Several days prior to the scheduled examination they were given haloperidol, a dopamine agonist with similar pharmacological effects to phenothiazines, to reduce anxiety and keep them calm during induction. But the pair weren’t amenable to hand injection on the day. Fortunately, in all zoo veterinary procedures there is a plan B (and usually a plan C, D and E). Keepers had also conditioned the Orang-utans to accept a mucosal atomiser device (also known as MAD) which creates a fine mist of a drug to facilitate trans-mucosal absorption. Medetomidine was delivered in this way, providing adequate sedation to facilitate easy darting with a combination of tiletamine hypochloride and zolazepam hypochloride, a rapidly acting sedative. The pair, were transported to the Zoo’s veterinary hospital where they were intubated and maintained on isoflurane in oxygen. Intravenous fluid support was provided and blood pressure was monitored throughout the procedure. The annual examination is an opportunity for the Zoo veterinarians to perform a thorough physical examination, attend to dental disease if present, collect samples and administer routine vaccinations. The Zoo’s Orang-utans are all vaccinated against encephalomyocarditis or EMC, a virus associated with acute cardiomyopathy and death in this species. Prior to the availability of a vaccine this was a problem in the Zoo, with a number of animals succumbing to sudden cardiac death. One affected Orang-utan survived for a year with a viral-induced chronic cardiomyopathy. Diagnosis is via viral isolation and typical cardiac pathology. A high titre in an unvaccinated animal is also supportive of a diagnosis. According to Vogelnest, the reservoir for the virus is rodents, so pest management is a vital element of prevention. “It occurs in particular geographical areas, with hotspots in various parts of the world. Certain species are more susceptible that others – for example Orang-utans and Chimpanzees are susceptible while Gorillas and humans less so, it will kill African elephants but disease has not been reported in Asian elephants. Males are also more to succumb than females. As Orang-utans are susceptible to tuberculosis, routine TB-testing is also undertaken during examinations. While heart disease is not a major health issue affecting captive Orang-utans, it has been identified as a major health issue in other primate species such as Gorillas and chimpanzees in North America. The Great Ape Heart Project, based at Atlanta Zoo, was established to address what was seen as a critical need to investigate and understand cardiovascular disease in great apes. The Project involves a central database in which to store data about cases, coordinate heart research activities and promote communication between zoos, research facilities and sanctuaries. One of the of the aims of the Great Ape Heart Project is to determine the reference ranges for cardiac structure, function and electrical condition in each of the great ape species, design an assessment protocol for investigation of cardiovascular disease in great apes and establish cardiac diagnostic, treatment and prevention strategies, including dietary modification if this is required. Sydney University companion animal cardiologist Niek Beijerink was happy to provide his services. He performed a full cardiovascular examination, including auscultation, echocardiogram and an electrocardiogram (ECG). He reviewed the literature on Orang-utan heart disease and found limited information. The signs of heart failure, when they do occur, are very similar to those reported in humans and dogs: lethargy, coughing, difficulty breathing, ascites and exercise intolerance. According to Beijerink, the Orang-utans’ hearts weren’t too different from the canine hearts he examines more commonly. “The heart of an Orang-utan is very similar to a dog’s heart…the only difference is the shape of the chest (in dogs the chest is flat sideways, in primates the chest is very wide sideways), which does influence where the heart can be found”. Beijerink admits to turning the probe on himself as an example of a primate to enable him to echo primates accurately and effectively. “At least I can say my heart is very similar,” he said. “The similarity in anatomy between humans and primates is fascinating, but not completely unexpected, since our DNA is 99 per cent similar to the DNA of primates”. One key difference is the amount of hair. 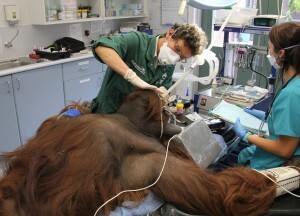 The beautiful thick hair coat covering the Orang-utans made it more challenging to obtain a good quality ECG or echo. Fortunately, Beijerink was able to use his standard equipment for the examinations. He routinely uses an ultrasound designed for human echocardiography, with an array of probes that can be changed depending on the size of the patient. This is vital as Beijerink’s patients vary tremendously in size – from a tiny kitten with a congenital heart defect to a 70kg Great Dane with DCM. According to Beijerink, neither of the Orang-utans had evidence of cardiovascular disease on examination – a not unexpected finding. Further data generated by veterinarians for the Great Ape Project will provide additional information that will be helpful for Zoo veterinarians assessing the cardiovascular health of Orang-utans. Zoo veterinarian Frances Hulst is currently in the Congo working at a large chimpanzee sanctuary that is supported by the Taronga Conservation Society Australia. Around 70 chimpanzees will be anaesthetised for cardiovascular assessment, generating a large data set that will benefit this and other primate species. As for Jantan and Willow, both made a full recovery and returned to their daily routine. For more information about the Great Ape Heart Project, visit this page.